During its 15th flyby of Jupiter, NASA’s Juno spacecraft captured a rare image of a Jovian “brown barge”. 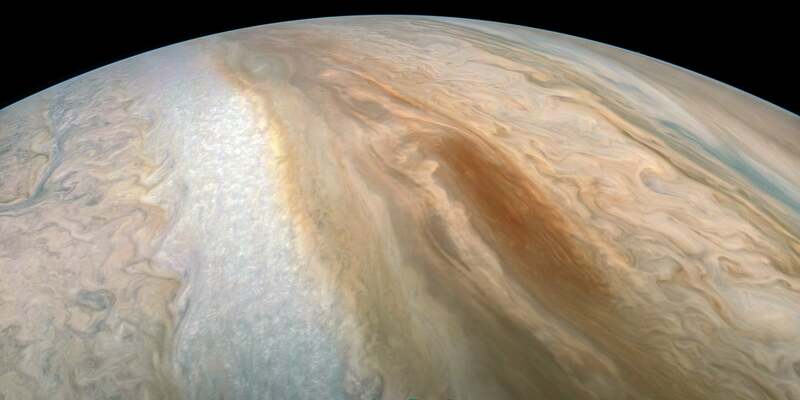 It isn’t nearly as impressive or picturesque as the Great Red Spot, but this big brown splotch is yet another reminder of many complex atmospheric processes happening on our Solar System’s largest planet. Also known as brown ovals, brown barges are large cyclonic regions that typically form in Jupiter’s dark North Equatorial Belt or, less frequently, in the dark South Equatorial Belt, according to NASA. This particular storm is located in the southern belt. Juno, which has been orbiting Jupiter since July 2016, took this picture on 6 September 2018 at a distance of 11,950km from the planet’s cloud tops. The colour-enhanced image was created by citizen scientist Kevin M. Gill, who used data from the spacecraft’s JunoCam, which is accessible to the public. NASA says it’s the first close-up view of this atmospheric phenomenon, providing an unprecedented glimpse of the detailed structures within the storm. This atmospheric feature is reminiscent of Jupiter’s Great Red Spot — an anticyclonic storm that’s been continuously observed by astronomers for the past 350 years. 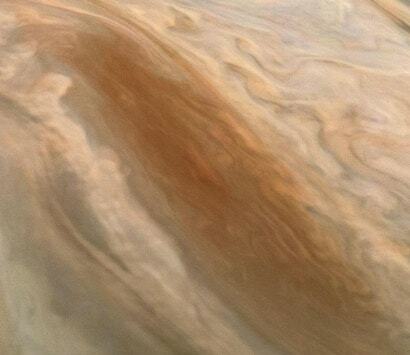 Unlike the persistent Great Red Spot, however, brown barges don’t last very long. This storm will eventually run its course, dissipate, and likely go through a new cycle of reorganisation. Most features within Jupiter’s belts and zones are short-lived, lasting anywhere from three to 15 years. Juno has now completed 15 flybys of the gas giant. Its next close encounter will happen on 29 October 2018. The good news is that Juno is still less than halfway through its mission; the spacecraft is scheduled to make another 20 flybys, the final one occurring on 30 July 2021. Hopefully there will be plenty more brown splotches and other exotic phenomenon in the months and years to come.